He was a German-born theoretical physicist who developed the theory of general relativity, effecting a revolution in physics. For this achievement, he is often regarded as the father of modern physics, and one of the most prolific intellects in human history. He received the 1921 Nobel Prize in Physics "for his services to theoretical physics; and especially for his discovery of the law of the photoelectric effect". The latter was pivotal in establishing quantum theory within physics. He published more than 300 scientific papers along with over 150 non-scientific works. 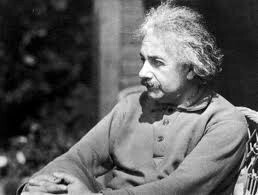 His great intelligence and originality have made the word "Einstein" synonymous with genius. At age 17, he graduated, and, with his father's approval, renounced his citizenship in the German Kingdom of Württemberg to avoid military service, and in 1896 he enrolled in the four year mathematics and physics teaching diploma program at the Polytechnic in Zurich. After graduating, he spent almost two frustrating years searching for a teaching post, but a former classmate's father helped him secure a job in Bern, at the Federal Office for Intellectual Property, the patent office, as an assistant examiner. He evaluated patent applications for electromagnetic devices. In 1903, his position at the Swiss Patent Office became permanent, although he was passed over for promotion until he "fully mastered machine technology". Much of his work at the patent office related to questions about transmission of electric signals and electrical-mechanical synchronization of time, two technical problems that show up conspicuously in the thought experiments that eventually led him to his radical conclusions about the nature of light and the fundamental connection between space and time. On 30 April 1905, he completed his thesis, with Alfred Kleiner, Professor of Experimental Physics, serving as pro-forma advisor. He was awarded a PhD by the University of Zurich. His dissertation was entitled "A New Determination of Molecular Dimensions". That same year, which has been called his annus mirabilis or "miracle year", he published four groundbreaking papers, on the photoelectric effect, Brownian motion, special relativity, and the equivalence of matter and energy, which were to bring him to the notice of the academic world. By 1908, he was recognized as a leading scientist, and he was appointed lecturer at the University of Bern. The following year, he quit the patent office and the lectureship to take the position of physics docent at the University of Zurich. He became a full professor at Karl-Ferdinand University in Prague in 1911. In 1914, he returned to Germany after being appointed director of the Kaiser Wilhelm Institute for Physics (1914–1932) and a professor at the Humboldt University of Berlin, although with a special clause in his contract that freed him from most teaching obligations. He became a member of the Prussian Academy of Sciences. In 1916, he was appointed president of the German Physical Society (1916–1918). In 1921, he was awarded the Nobel Prize in Physics. Because relativity was still considered somewhat controversial, it was officially bestowed for his explanation of the photoelectric effect. He also received the Copley Medal from the Royal Society in 1925. He received the 1921 Nobel Prize in Physics "for his services to theoretical physics, and especially for his discovery of the law of the photoelectric effect"